Our partner language school, Bristish Study Centres, is an ideal venue for developing your English language skills whilst studying in the heart of one of Europe’s most beautiful and exciting cities.The school is run by a group of friendly, well-educated language teachers who have wide experience in teaching English to foreign students. The intensive English course in Edinburgh consists of 15, 20, 25 or 30 lessons per week in groups of 14 students maximum. Lessons are focused on developing communication skills (reading, speaking, writing and listening). Students aged 16-17 years: Students under 18 have to pay a supplement for staying in a host family; this will be added to your invoice after booking. double room: € 19 per stay. Please note that all students aged 16-17 will be placed in shared homestay accommodation during peak season. This is the price for an airport transfer on arrival at Edinburgh Airport. Airport transfer on arrival at Glasgow International: € 188. Please let us know the arrival airport at the time of booking. 01/01/2019, 02/01/2019, 19/04/2019, 22/04/2019, 06/05/2019, 27/05/2019, 25/12/2019, 26/12/2019. No refund is made for classes scheduled to take place on these days. The Cambridge course in Edinburgh of 6 weeks consists of 25 lessons per week focused on exam preparation. The course prepares for the FCE or CAE exam. The Cambridge Course in Edinburgh prepares for FCE and CAE level, not CPE. Prices do not include exam fees (approx. 150 GBP). Please note that the exam takes place during the week after the course has ended, so an extra week's accommodation is needed. Access to dedicated study room, exam preparation materials and academic guidance is provided during that week. 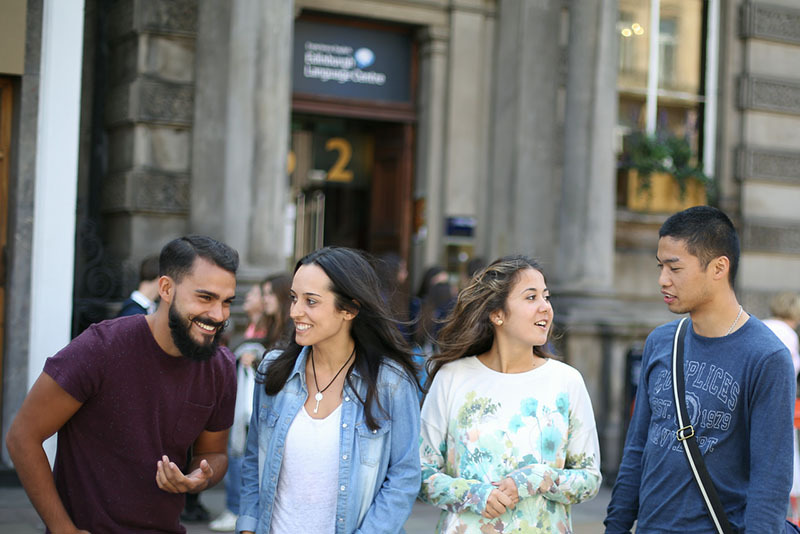 The IELTS course in Edinburgh consists of 30 lessons per week. The programme includes 15 IELTS exam preparation per week plus 15 General English lessons per week (of either Speaking, Listening, Grammar or Writing). If you would like to take the IELTS exam after the course, you need to register a long time in advance at www.ielts.org. The one-to-one language course in Edinburgh consists of individual teaching with a private native professional, is specially designed for those students with specific language needs and is adapted to suit the student. The course consists of 20 lessons per week but the lesson quantity can be increased or decreased if necessary and can be done by contacting us. The 4 or 5-week CELTA (Cambridge Certificate in English Language Teaching) teacher course consists of minimum 120 hours giving non-native teachers of English a thorough grounding in all aspects of teaching the English language to adults.The CELTA course is for anyone who is at least 18 years old and is competent in both written and spoken English (C1 minimum). The CELTA programme is either a 4 or 5-week course. Depending on the amount of weeks, you can choose different starting dates (see below price table). Both the 4 and 5 week courses include approx. 120 hours in total. The 4 week programme covers tuition from Mon- Fri.
During the 5-week programme, the Wednesdays are "study days", in order for the participants to work on their assignments. Both the 4 and 5 week courses include approx. 120 hours in total. This Club 50 course consists of 20 General English lessons complemented by 3 historic and cultural activities per week (in the afternoon). It is a great way to learn English and explore both Scottish culture and Edinburgh. An intermediate understanding of the English language is required to enter this course (minimum level B1). The course can be booked for either 1 or 2 weeks. It is also possible to book additional activities at the school, when still available. If insufficient students are attending the course at the same level, classes will be mixed with students of all ages. So, if this situation arises, you will be in a group with not just 50+ students. 50+ Course activities will, however, always solely take place with 50+ participants. The apartments are located in the Broughton quarter, conveniently located a short distance from the city centre. The school is located at about 25 minutes walking distance. Each apartment has 5-7 bedrooms, all with private bathrooms and a common living room and kitchen. In each apartment there is Wi-Fi available (supplement). In the complex there is also a common room with television. This space is open 24 hours a day and accessible to all residents, including British students. Bed linen is provided, but will not be washed. You can use washing machines and dryers in the complex. Your stay is based on no meals. Living with a Scottish family in Edinburgh is the best way to fully understand and appreciate the Scottish way of life. The host families are fully accustomed to having foreign students and are incredibly friendly. You will integrate into the family very quickly and practice English at every opportunity. You can choose between breakfast or half board.